Heard of coconut oil? It’s the new latest ‘it’ ingredient, made popular, in part, because of the Paleo Diet. 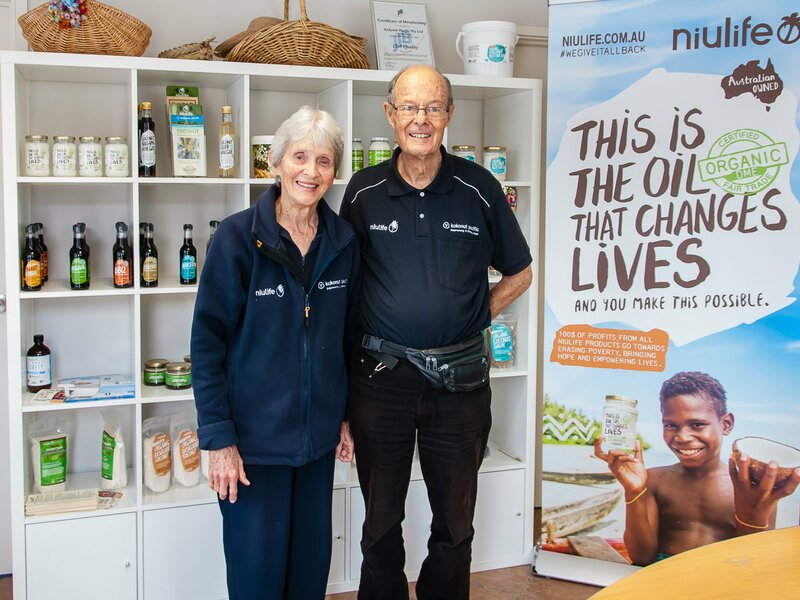 But long before it graced the shelves of health food stores (or even supermarkets), one Canberra couple were innovating in the production of coconut oil. Dr Dan Etherington was an agricultural economist and development lecturer at Australian National University with a passion for wanting to help people in Pacific Island countries. He noticed that one of the most abundant natural resources was coconut. It was a large export item that graced many a multi-layer cake, but the local people didn’t receive many benefits from the cash crop. This was because coconut at that time, and largely still today, is mainly processed into dried copra, then exported to other countries (including Europe) for processing into desiccated coconut. This was wasteful, expensive and the local people were not compensated very well. Dan felt that there had to be another way. He set about commercialising a new method. At a time when most people are looking forward to retirement, he and his wife Maureen started on a new venture – inventing a process to enable the extraction of extra virgin coconut oil in the villages in which the coconuts were harvested. Nor did they have any idea at that stage that coconut oil would become hugely popular for cooking. When they first thought about setting up a coconut oil business, they thought it would only be used as an ingredient in soaps and cosmetics (their range does include some rich coconut soaps). It was only later that research about the health benefits of eating coconut oil began to emerge. Dan and Maureen started in 1994 by selling presses to a local company in Samoa. Later that operation was sold to a company in New Zealand. They then felt a calling to work in the Solomon Islands, and in early 2004 they began operations in partnership with a local company. The Solomon Islands were at that stage recovering from civil war, with help from the Regional Assistance Mission to Solomon Islands (RAMSI). The country needed to rebuild everything: infrastructure, schools and health clinics. There was little viable export business at that stage. 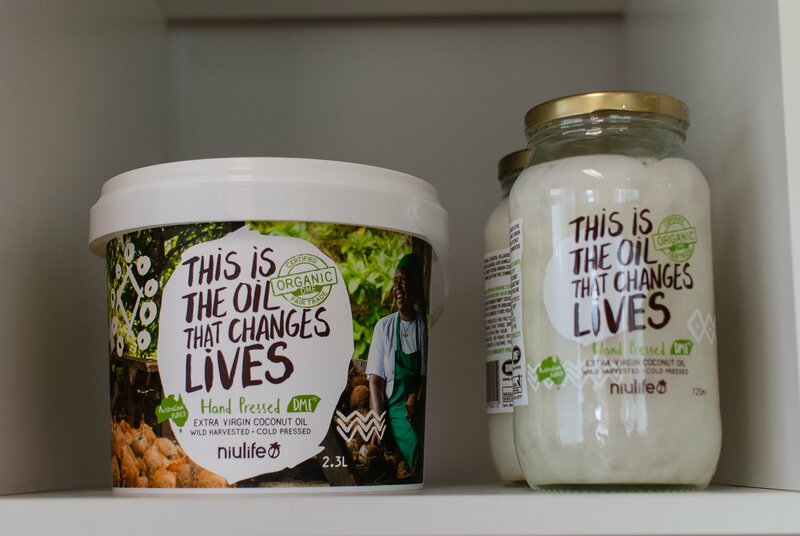 Fast forward to now, Kokonut Pacific now imports coconut oil produced from 50 communities in the Solomon Islands, selling half in Australia under the Niulife brand and exporting to over 10 countries, recently winning the ACT Agribusiness Chief Minister’s Export Award. The communities don’t produce all the time; weddings, funerals and even tsunamis disrupt production. But the wild palm trees are abundant producing a new bunch of coconuts every month, so this provides a readily available resource for local people whenever they need to convert coconuts to cashflow. Kokonut Pacific is a social enterprise with 100% of all profits going to a charitable foundation set-up to aid the oil producing communities that use the presses. Kokonut Pacific imports and exports around 170 tonnes of extra virgin coconut oil a year. 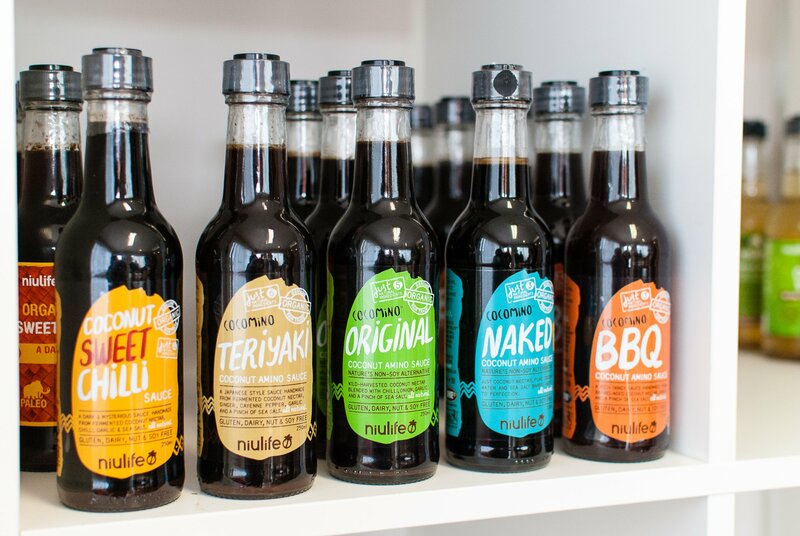 Half is sold in Australia as Niulife through health food stores, whole sales distributors, online, and at its factory in Queanbeyan (open Monday to Friday from 8am to 5pm). In addition to the pure oil, Kokonut Pacific also sells a range of coconut oil products (even for pets! ), coconut sugar, and a range of soy sauce substitutes made from coconut nectar (suitable for people who can’t eat soy products).